1. Allow for plenty of time to fright-prep. As a parent, you know your child best. Keep a look out for fears and anxieties about Halloween. The best way to handle fear and get a toddler ready is to discuss what's going to happen. Reading books and stories to your child about trick-or-treating—and Halloween in general—are great ways to help that discussion. You might even want to have your child practice in his or her costume before the big day. 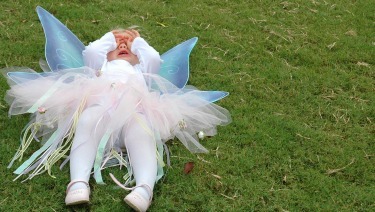 Toddlers need to know that Halloween is just for fun and the scary stuff is all pretend. If your little one doesn't want to partake in Halloween, then let that be okay. There is always next year, and 12 months can make a big difference! Allowing your baby or toddler to squish his or her hands around the insides of a pumpkin can be a great sensory activity. For little ones who "hate getting dirty," there are plenty of no-carve pumpkin decorating options to try. 3. Go out before dark. Infants and young children thrive on routine, and it is easy for Halloween festivities to throw those routines off-track. If your schedule permits, try trick-or-treating while it's still light outside so you can stick to your child's regular bedtime. If your child is sleeping, try putting a "please knock" sign on your door for other trick-or-treaters. ​If Halloween doesn't start until after dark where you live: Check your local newspaper or recreation center for Halloween activities offered earlier in the day. 4. ​Watch for tripping-toddler hazards. Even on their best days and in the best conditions, it is still a struggle for some toddlers to walk without falling. While you won't be able to prevent all of the tumbles, choosing a costume that is not too long or too bulky will help a great deal. Be sure to check the forecast before you go out and try to include layers if needed. Also remember to help your little one climb up and down any steps and porches. 5. Always have a "Plan B" costume. From leaky diapers to spit up to toilet training accidents, this age is always reason to pack a backup costume and plan for the unexpected. If potty-training is still a new thing and there's a narrow window between "I have to go" and an accident, you might want to rethink a complicated costume. There is also no harm in putting him or her in an easy-on, easy-off diaper. 6. Be ready to pack it in early if needed. A house or costume that's too scary, a trip or a fall, or just a hard day can send your child into the temper-tantrum zone. But all is not lost! If your toddler quickly loses interest in trick-or-treating, see if he or she would prefer to answer the door and hand out candy to all the "big kids" instead. Plus, it can help you reinforce those importantsharing skills! 7. Take precautions with added sugar. Although Halloween and sugar often go hand in hand, the AAP recommends limiting the amounts of sugar kids get each day. This may not be an easy task when most Halloween treats are packed with added sugar and artificial colors your little one doesn't need. Look out for snacks and treats that may seem "healthier" but still contain added sugars—flavored yogurts, flavored milks, sugary cereals, granola bars, juices, and fruit gummy snacks. Other options for trick-or-treating toddlers, or those who choose not to give out candy, include crayons and notepads, stickers, stamps, chalk, bubbles, tattoos, playdough, or stuffed animals. If your baby is six months or older and is just starting solid foods: You can get him or her into the Halloween spirit with some pumpkin purees. Whether canned, frozen or fresh, pumpkin is packed with nutrients for your growing baby—beta-carotene, vitamin A, potassium, vitamin C, calcium, and more. Other fall-themed options include butternut squash, sweet potato, or roasted apple purees. You can even mix in a pinch of cinnamon or nutmeg to add in fall-inspired flavors. Ideas for older toddlers: Seasonal treats may include soft bites of roasted apples or apple sauce, baked sweet potato fries dusted with cinnamon, apple zucchini muffins, pumpkin-inspired smoothies, or fruit ice pops made with fun Halloween molds. ​​8. Watch for any treats that can be a choking hazard. Keep an eye on what your child has in his or her mouth at all times while on the trick-or-treat trail—it's so easy to get distracted! It's best to avoid eating while walking or running. Once your child is ready to enjoy treats at home, keep in mind that babies and toddlers should not have any hard candies, caramel apples, popcorn, gum, small candies (jelly beans, etc. ), gummy candy, pumpkin seeds, or anything with whole nuts. Candy wrappers, stickers, small toys, or temporary tattoos can be a choking hazard, as well. As all parents know, babies and toddlers will put just about anything into their mouths!